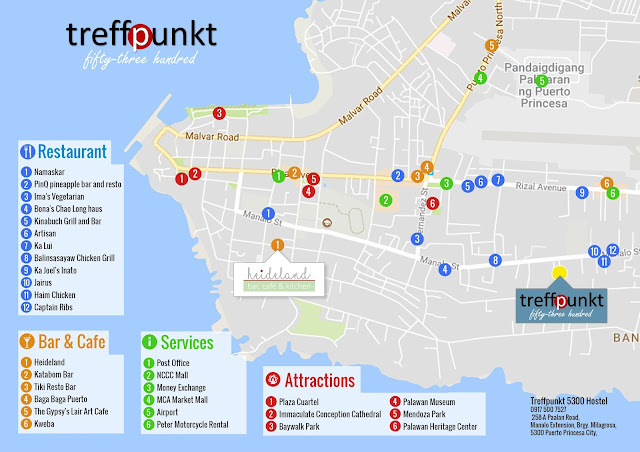 Treffpunkt 5300 Hostel is tucked in a small residential street of Puerto Princesa City but it is not that far from the main places and establishments that you would want to check out. 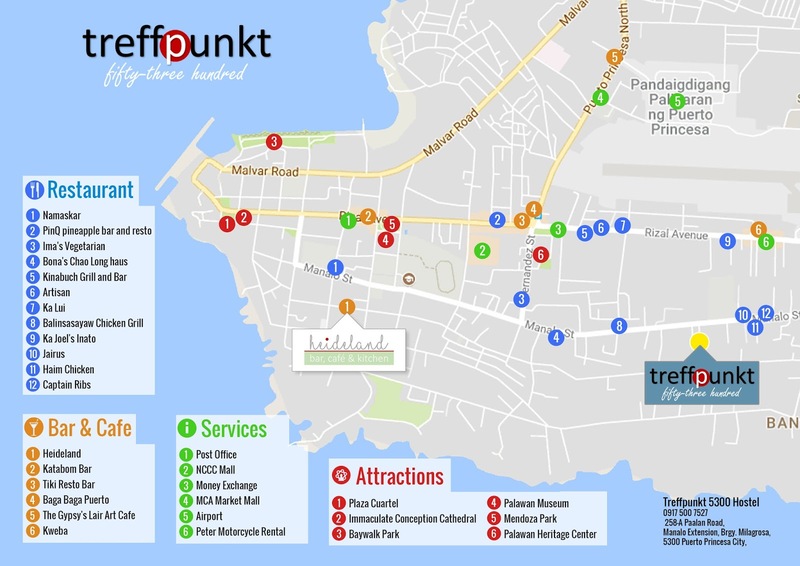 If you want food, you can walk to the next Filipino, French, Italian restaurants in 5-10mins. As for the night, the talked-about Tiki Bar (the only one) is just a 10Php trike ride away but go there when it is really late. If you want to chill, Gypsy's Lair offers a good cosy place with acoustic music. Kataboom is also one of our top picks. Our team members must have their own favorite places, so feel free to get their personal take on these places. And if you are looking for a place to work, check out our other place, Heideland, if you need good internet connection and lots of coffee. Ka Lui is a MUST-TRY restaurant. Reservations are recommended. Just approach us if you need assistance. They have a set menu that is enough for 2 people at ~700Php (~14Eur). *Special thanks to Paul, our WorkAwayer, for providing us with the map.